Welcome to an ongoing series of articles and deep dives TUNE will be delivering to help marketers find, understand, and take action on fraud. 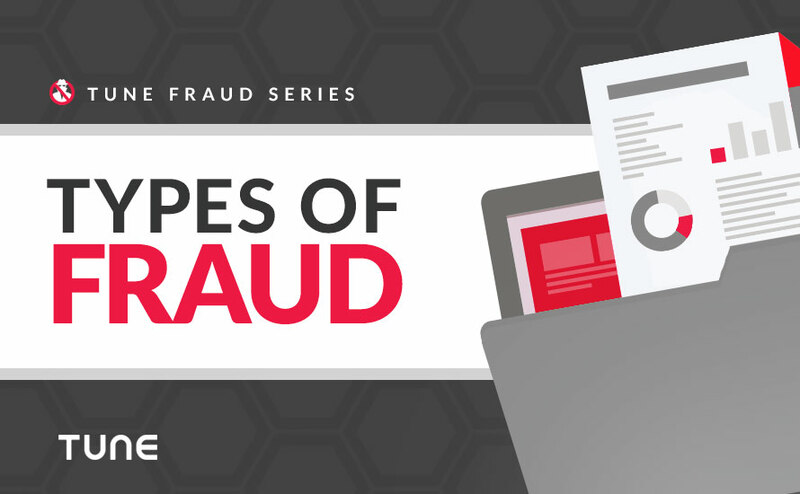 This first article will help build a foundation by introducing the types of fraud marketers face. Let’s get started! Fraud can have a tremendous impact on your business. It’s a pervasive issue that cannot be ignored, and it is critical to have the right tools to fight it. Know your enemy: First things first, let’s cover all the different types of fraud that exist so we can combat it effectively. There are many different ways the ads in your marketing campaigns can be hacked. This blog post will cover some of the most common methods. 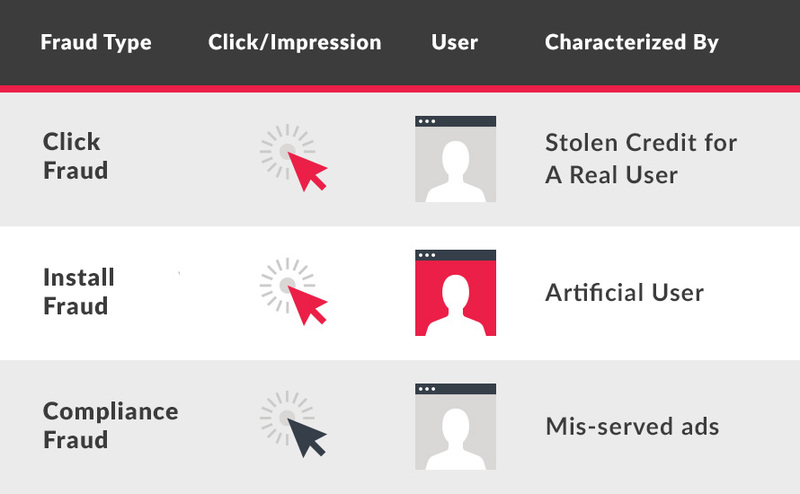 Characteristics of the ad click: was it genuine? Characteristics of the install: was it genuine? In the table below, red indicates fake and gray indicates genuine. Click fraud occurs when clicks are simulated on a real user’s device even though the ad was not displayed or clicked on. This is a high-return opportunity because it only requires one faked action — the click. Marketers with a large volume of organic users can be especially susceptible. When the fraudster simulates a click on a genuine user’s device, they take credit once the user installs the app on their own. Since the user is a real human with genuine interest in the app, they behave like the typical organic user and don’t raise a red flag. Clicks can be simulated on a mobile device even though the user never clicked the ad. The idea behind this scheme is to maximize chances that the fraudulent partner receives credit when the user ends up installing. Credit might be taken for a user who would have installed the mobile app organically, or stolen from another partner that actually contributed to the install. This tactic is similar to “cookie stuffing” in the old web days. Ad stacking and pixel stuffing are tactics to claim credit for ads that were never actually visible on screen. Ad stacking is when multiple ads are placed on top of each other so only the top ad is visible, and ads on the bottom of the stack are never seen. Pixel stuffing is when an ad is placed in a 1×1 pixel and then packed in a small area. Even though it is not visible, it still registers an impression or click. The Android operating system can broadcast to all existing apps when a new app is installed on a mobile device. Malicious apps take advantage of this broadcast by performing click injection. When the malicious app recognizes a new app being installed, it can run rogue code to fire a click before the new app is opened. Since the fraudster appears to have served the ad that resulted in the last ‘click,’ they get to claim the credit. Install fraud is a tactic used to impersonate real human behavior when it is actually 100% disingenuous. This form of fraud is designed to quickly scale a user base and drive up costs for the marketer. These users are not genuinely interested in the app. These are either real humans with malicious intent, or bots that are generating this traffic. 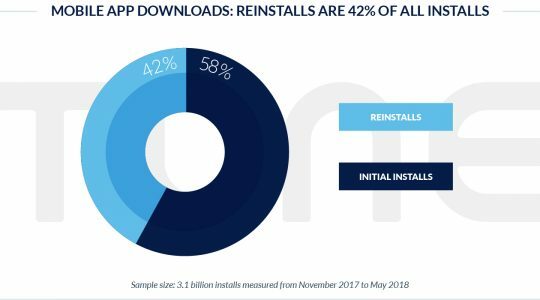 App install farms consist of paid workers who are given mobile devices on which to manually install and uninstall apps repeatedly. These ‘farmers’ can fake in-app purchases to appear as genuine users and stay under the radar. The humans performing these actions have no intention of using the app for its desired purpose. Their only goal is to simulate real traffic to an app. If a mobile device is infected by a bot, it can run code in the background to mimic human behavior. Without the user’s knowledge, bots can install apps and perform in-app activity. Bots can be controlled by a botnet that acts as the master and gives orders. The goal is to deceive marketers into believing these installs are coming from legitimate users. This type of fraud is characterized by ads served in an environment or context outside the terms the partner has agreed to. This tactic is used to draw in cheaper traffic, while deceiving the marketer into paying a premium price. 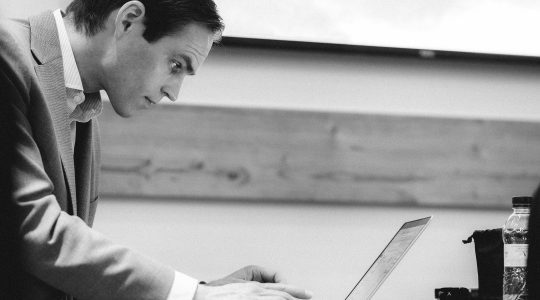 This form of fraud draws in real users, but since they were not the ones that should be targeted for the campaign, they may not be the quality or generate the value that the marketer expected to receive. This form of fraud occurs when ads are served in the wrong environment or format, or in a place that the marketer has specified against. An example could be ads served on a site that receives a lot of impressions but is not the marketer’s targeted demographic. This is considered compliance fraud since ads are not being served in the right context. Traffic is incentivized when users are offered a reward for performing an action like clicking an ad or installing an app. It may be easier to draw in users when they have an incentive, but there is no guarantee that these users have genuine interest. If a partner is serving incentivized traffic, but the marketer specified that the traffic should not be incentivized, it is a form of compliance fraud. The price of traffic can vary based on the location in which it is served. If the marketer’s campaign was to be run in a Tier 1 country to target users with a higher assumed lifetime value (LTV), but instead is served in a Tier 3 country where traffic is cheaper, it is compliance fraud. Usually your Insertion Orders with the ad partner will include geo-targeting requirements. Thus, when users are knowingly targeted outside of these specified locations it is a breach of the contract. Undisclosed re-brokering occurs when the partner violates their agreement not to sell placements to a third party. When the ad is ultimately shown, it may not reach the audience originally intended, and the marketer may not have transparency into where it ended up being served. Some marketers do not want their campaigns to be re-brokered so they can control their brand and message. Arbitrage is a necessary component of advertising commerce, and occurs when a partner purchases inventory (often remnant) and resells it at a higher price. Think ‘buy low, sell high.’ In itself, arbitrage is not considered fraud. In many instances, ad networks use arbitrage to effectively increase efficiency and scale. However, it can enable misrepresentation by allowing partners to repackage inventory in a deceptive manner. When lower quality traffic is knowingly substituted, or misrepresented, this can be a form of compliance fraud. This form of fraud involves presentation of an ad in misleading context. It can lead a user to click accidentally, or contain a bait-and-switch where the results don’t meet reasonable expectations. Deceptive ads trick the user into interacting with the ad on a false pretense and are generally created outside of any guidelines you or a reputable marketer would require. If the marketer is going to allow partners to create ads, they can request prior approval to prevent any deceitful activity. 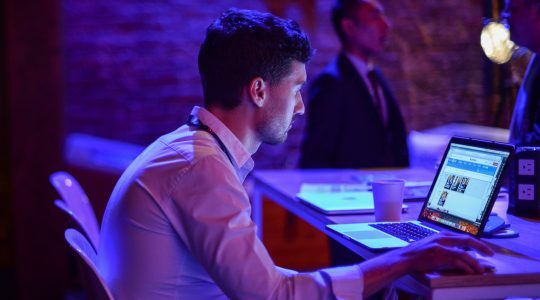 During real-time bidding, fraudsters can use domain spoofing to intentionally replace their domain name with a more desirable one with the goal of attracting premium traffic. While the marketer believes their ads are being displayed on one traffic source identified by one domain, their ads are unknowingly being displayed on an unrelated traffic source associated with a different domain. 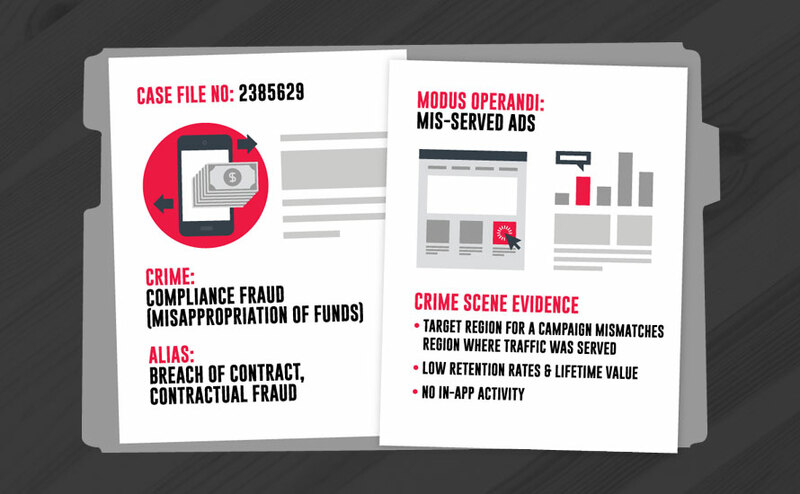 Now that we have covered the basic types of mobile ad fraud, you will be able to better understand the motives and mechanisms behind each tactic. 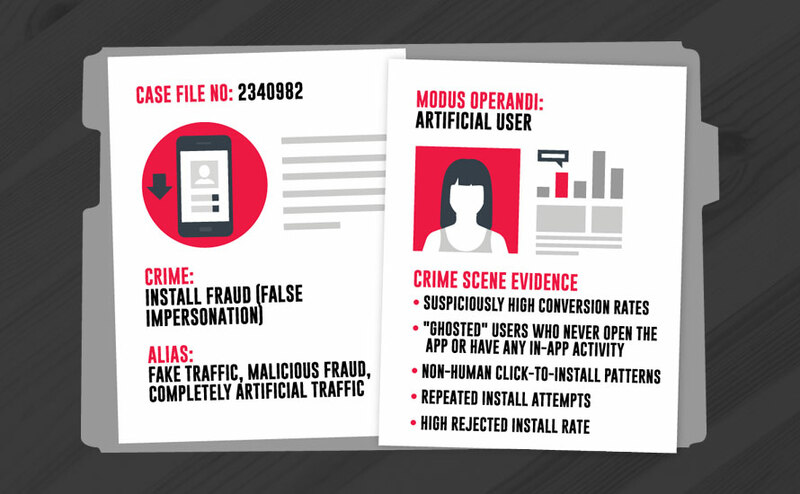 Knowing the enemy is the first step in combatting ad fraud. 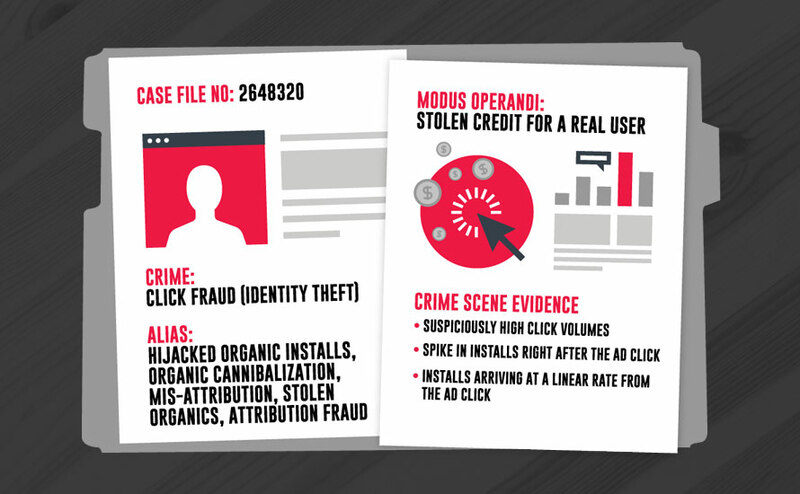 Continue to the next article in the TUNE Fraud Series, Mobile Click Fraud Impact, which dives into click spamming, click stacking, click injection, and beyond. Jessica is team lead for TUNE Marketing Intelligence. Her past experience includes analysis and visualization of data for large cancer and diabetes research organizations. She joined TUNE in 2015 and has since helped create a turnkey, extensible business intelligence solution for mobile marketers using Tableau software. In her free time, she enjoys playing violin and riding motorcycles.